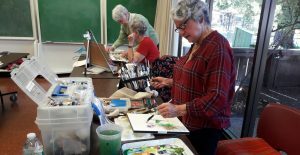 Goldenaires Activities, Events & Classes for older adults. M-F, 9:00 a.m. - 3:00 p.m. Schedule: 9:30-10:45 AM, Aerobics, Stretch & Strength. 10:45-11:00 AM, Guided Relaxation. Mondays from 11:30AM to 3:30PM. Practice your painting skills and create new things in a fun-loving, encouraging environment. Bring your own supplies. Ongoing. New persons may join at any time. YVONNE BROWN, artist, is willing to guide/suggest painting techniques. Tuesdays from 9:30 AM to Noon. Norma Smith-Axton & Linda Jernigan, are the volunteer instructors. Chinese tiles are used for (Asian) play. No fee – this is an ongoing program. Instructors will assist in helping members learn the game. Tuesdays from 12:15 to 3:30 PM. Join and play with your fellow members & friends. Open to Goldenaire members - men & women. Open Play Tuesdays and Fridays from 9 AM to 4 PM at Albert Park - right next door to the SR Community Center. $4.00. If interested in lessons, please arrive at 9AM or after 12 Noon. Everyone is welcome and no experience is required! League play begins in March-October. Goldenaires subsidizes part of league fee-$15/ team. It is a lot of fun, great exercise and you’ll meet new friends. For more info, call the Bocce office (415) 485-5583. Tuesdays: 10-3pm. Small fee for the instructor’s mileage. Please bring your own supplies. Instructor: Anne Carroll, professional artist. Also, check out the display of paintings in the hallway - BEAUTIFUL work from beginners & advanced artists and pictures are for sale! In the office, we now sell greeting cards hand-painted by these talented artists – only $3 & $4 each! We now have ceramics to sell! Fridays 12:00-3:00PM Enjoy the fun of learning new crafts while making new friends. The craft group meets every Friday. They design some items and hand-make all our crafts -- ideas here are always welcome. Our items are always on sale for a reasonable price, so come down and look at the display in the trophy case and in the Goldenaires office. Better yet, if you have a talent you would like to share with the craft group, come on down and join us. Don’t be left behind-bring your own device- PC, MAC & IPHONES. Instructor: Erica Kaplan welcomes all levels of interest. EMAIL,INTERNET & TEXTING. Fridays from 9:00 AM to Noon A great, inexpensive, fun class that promotes a truly rewarding hobby. Beginners welcome! NO FEE. Students help out, teaching each other techniques and showing you how much fun wood carving can be! HICAP (Health Insurance Counseling Advocacy Program) offers free and confidential information and assistance with understanding Medicare benefits and rights, solving medical billing problems and filing claims and appeals. HICAP meets at the San Rafael Community Center from 1-4pm on the 3rd Thursday of each month! CRAFT FAIR RAFFLE- BASKETS-WE NEED GIFTS! Don’t know what to do with those gifts you received during the holidays, birthdays, anniversaries, etc. that you can’t return and have no use for? Bring them to the Goldenaires office (new & in original boxes if possible). Also wine or gourmet food are a hit! We can use them for our raffle baskets at the craft fair which is a fundraiser for the club! We can store the items here! Also, if you have large baskets for the raffle, please drop those off at the office. Thank you!